French Emblems: Emblem: Vinum ingenii fomes. Peaceful Amyclae, you set up a statue of Bromius [Bacchus] the grape-bearer: but why as a flying creature with swift wings? Bacchus takes inventive genius from the soil, and elevates the mind, And carries it on wings like Pegasus’s. vocabant, quò respexit fortasse Catullus eo versu. At parte ex alia florens volitabat Iacchus. Egregio vati vinum fit Pegasus ales. A heroic hexameter is put next to an Alcmanian or Archilochian, as in Emblem IX above. Bacchus was worshipped at Amyclae, a city of Laconia, notorious for its deadly stillness, under the surname of Psilas, which you might translate as ‘winged’: for in their language they call wings ‘psila’; it was perhaps this that Catullus was referring to in that verse: ‘But in another place abundant with flowers Iacchus was fluttering about.’ The sculptor [of the statue of winged Bacchus] (as is recorded by Pausanias in the Description of Laconia) intended this to mean that Wine, in moderation, blunts the cares of sorrow; it renders the mind agile and quick-witted, in just the same way that birds [p.123] soar on their wings. Notwithstanding Pliny follows Eubolus in saying that wine clouds one’s wisdom, I nevertheless agree with the opinion of Plutarch, who attributed originality and inventiveness to [drinking] wine. For as he says in his Symposium, some people surpass themselves while drinking with the sharpness of their invention and the eloquence of their speech, which, when they are sober are dry and inarticulate; and in the enthusiasm brought on by wine, these people feel themselves suffused and filled as if with the smoke of some sort of incense, and their shyness, which inhibits their spirits from being expansive, is exploded: for wine is a most fertile tutor of free and so true speech, without which talent and hard work are of no use. Wine (according to Plato) suffuses both the soul and the digestion with warmth. For this reason we read that Aeschylus, the noblest of poets, never wrote his tragedies except in his cups; that Ennius was full of wine when he began singing his martial poetry; that the ancient heroes took counsel on the most important matters over wine. To be sure, it is not likely that they were drunk or, which is the same thing, that their minds were befuddled when they were writing or taking counsel, but [that they did these things] after having fortified themselves with drink, and dispelled the sluggishness that comes from abstention. Apropos this emblem, Niceratus sang: ‘For the excellent poet, wine serves as a winged steed’. [p.124] Bacchus should be painted as a boy, naked, beardless, ruddy in complexion, with a happy expression, garlanded with vines, with little horns coming out of his forehead; his body will not have a fat paunch [lit. 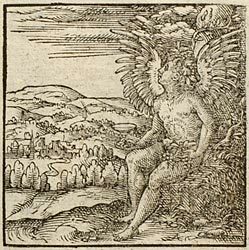 not have the appearance of an overfull waterpipe], but will be strong and sprightly; he will be winged, with wings sprouting from his shoulders; in one hand he holds a bunch of grapes, in the other, if you please, a goblet. His eyes are bright, and look up to the heavens. 1. Amyclae was a lovely spot in the Peloponnese, the birthplace of Castor and Pollux. 2. Another name for Bacchus. 3. The early Roman poet (3rd century BC). 4. An otherwise unknown epigrammatist.